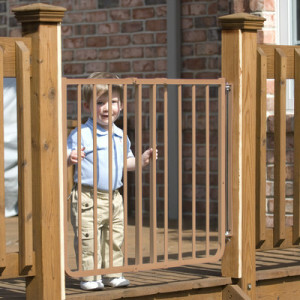 Outdoor baby gates are the perfect way to give your child a breath of fresh air without putting their safety at risk. In order to promote their healthy development,children need to experience the outside world, instead of being trapped indoors within the same boring walls. 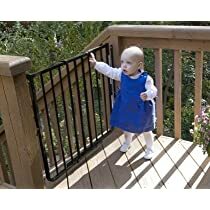 Nonetheless, in their early development stage; babies are still vulnerable to a myriad of dangers and require constant supervision and use of safety accessories such as outdoor gates. Such gates will allow you to give your children access to the outside beauty without compromising on their safety. 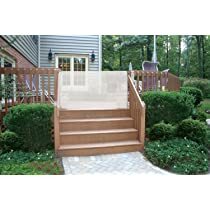 Outdoor safety gates are suited best for use on your driveway, deck, stairway, porch or pool areas. 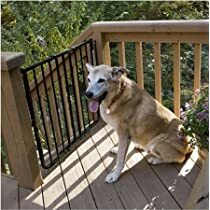 These gates can also double as pet gates to either keep your pet in the house or out in the garden off the deck. It is important to choose gates that are rust-proof and weather-proof, able to withstand the harsh outside environment. 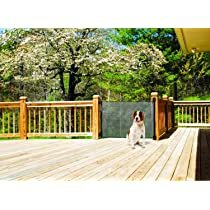 If you are looking for retractable gates to fix either at your patio or deck area, here are some of the best that retract when not in use. 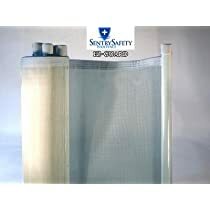 They feature durable and sturdy mesh construction including plastic components. 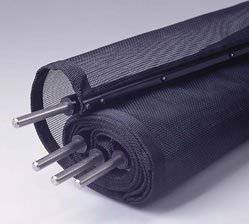 The mesh and plastic components are UV treated to withstand outside environment. The mounting hardware is made of galvanized steel. 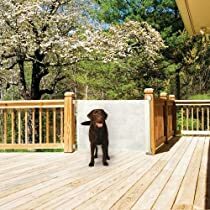 If you need a gate to put at the top of the stairway on a deck, in order to keep your children safe, then one of these will do the trick. These gates will also help turn the porch into a safe, outside resting room for your child. The gates feature rustproof, lighter weight aluminium construction ideal for outdoor applications. 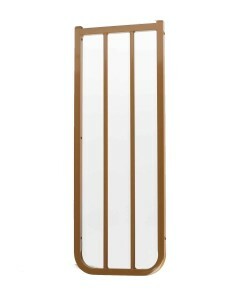 This brown gate has been designed for top of stairs at outdoor areas.It has a latch that makes it easy for one hand operation. It swings open in both directions. A safety stop bracket has been included to help prevent it from opening out over the stairway. It is easy to install and to remove without unscrewing the wall mounted hardware. It features light aluminum construction with powder coated finish ideal for outdoor use. Stainless steel rustproof mounting hardware has also been included. 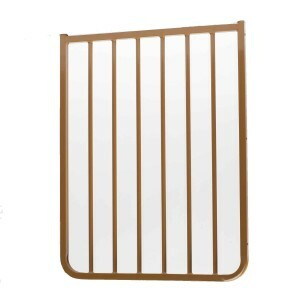 The gate is 27.5 inch high and has an adjustable width of 27 to 42.5 inches. Below are 2 extensions of different sizes that are sold separately. This is an optional 21.5 Inch extension of the above Cardinal gate. It is constructed with aluminum and powder coated finish. It is easy to assemble. This is an optional 10.5 Inch extension of the above Cardinal gate. It is easy to assemble.It is constructed with aluminum and powder coated finish. 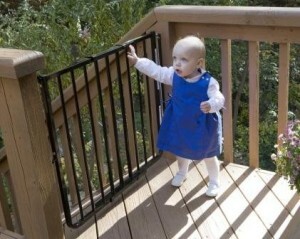 These outdoor plastic and mesh nets provide a safety barrier between the railing and your child. They are weatherproof for use on balconies, deck and porches. They have tie straps included. 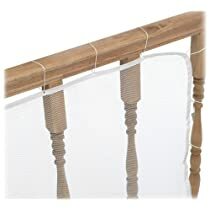 They are safe to use to prevent your child and even pets from squeezing through the stairway, deck or balcony railings. The nets have smaller openings without any finger or toe holds. They are also easy to install as you just need to attach them with the tie straps. 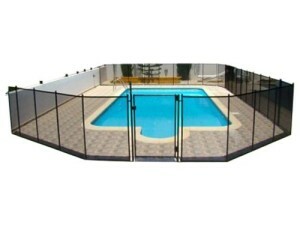 These safety fences will keep your pool area secure offering protection for your kids and pets. 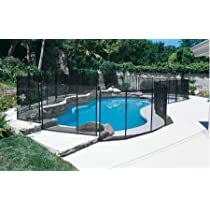 The fence helps to create a barrier all around the pool’s edge so that children, toys or pets do not access the pool unsupervised, therefore protecting from accidental drowning. Get one of these and you no longer have to worry if your child gets close to the pool . 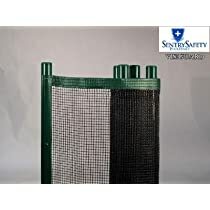 This safety fence comes with panels that are made of flexible, climb-resistant sturdy mesh. It comes in 2 sizes ,the 4 feet by 12 feet, size and 5 feet by 12 feet, size. 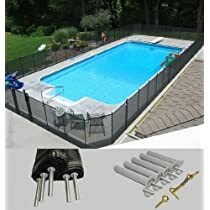 It is easy to install and to curve the fence around the pool edges. During installation, 5/8-inch holes have to be drilled. The screws and posts are made of stainless steel hardware that does not corrode or rust. The fence is easy to remove and reassemble quickly. The mesh rolls up when not in use for compact easy storage. The fence has plastic covers included for use when the fence is not in use. 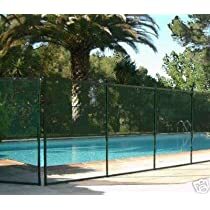 If you desire to install a gate for the fence, you need to buy it separately here. 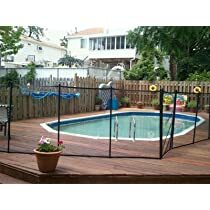 This fence comes with instructions, hardware, a free installation video and measuring template included. 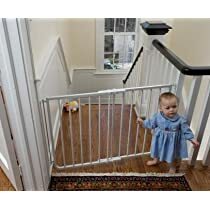 These gates truly are the easiest way to keep your child safe while still giving them the luxury to discover the outside world.